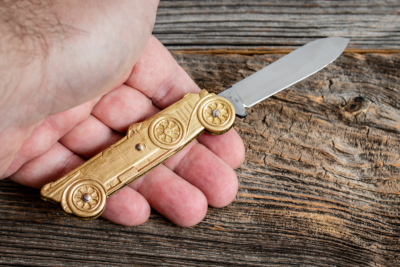 While the pictoral motifs of most Coursolle knives do not affect the actual shape of the handle, this motif knife features brass scales that are shaped like a vintage sports car. 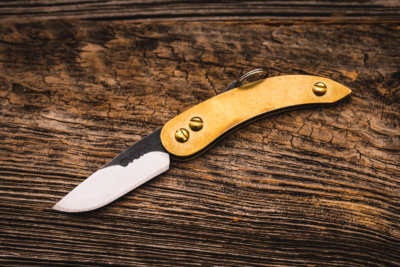 With a total length of 14.5 centimeters and a weight of only 38 grams, this gentleman's folder is a lightweight companion to your larger EDC knife. 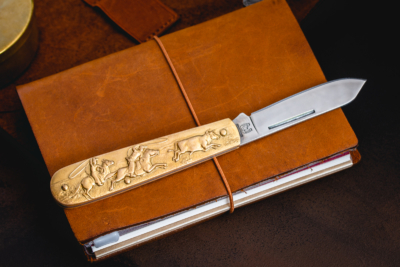 The front handle scale of Rough Rider's Cowboy Knife shows two cowboys wrangling a cow, the back scale depicts a cowboy sitting on a horse. 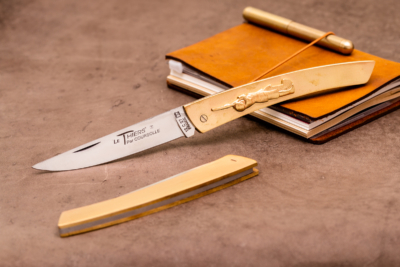 The Le Thiers is a knife model that represents the history of France's capital of cutlery. 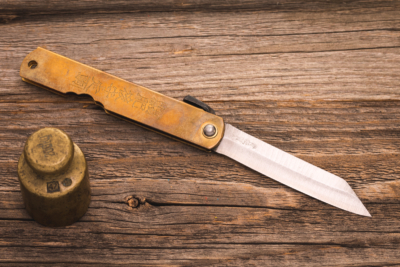 Couperier Coursolle offers two versions with brass handle scales. 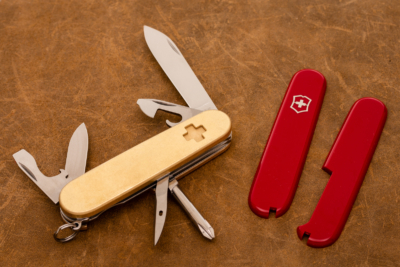 Upgrade your ordinary red-handled Swiss Army Knife with a pair of stylish brass scales. The scales fit all models of the 91 millimeter Victorinox line of SAKs. 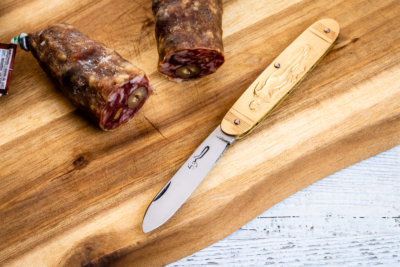 Couperier Coursolle has gained a worldwide reputation for its iconic motif knives. 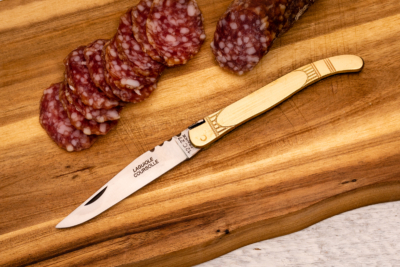 What is lesser known, though, is that they also make a Laguiole knife with brass handle scales. 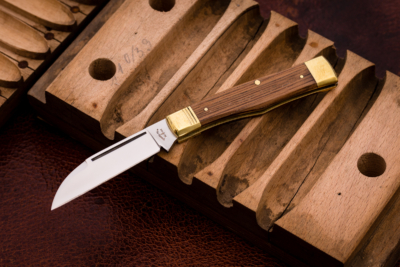 Brass liners, brass pins, brass bolsters – the Gunflint by Trestle Pine Knives has all this and a lot more to excite you. Lightweight and compact, the Svörd Peasant Micro can handle most of your general everyday cutting tasks. Once admired for its simplicity and ruggedness, Japan's iconic folding knife, the Higonokami, has almost fallen into oblivion.